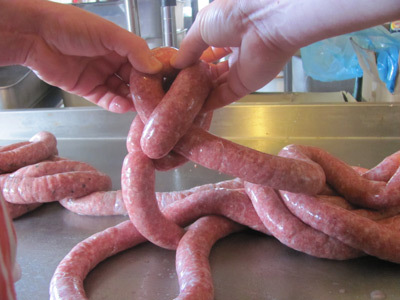 Learning how to link sausage has been an ambition of mine ever since I saw sausage hanging up in the butchers shop. Having never worked in a butchers then chance of actually ever having the need to do it or indeed the materials seemed to evade me until I started making my own homemade sausages. I've read books that describe how to do it but every time I tried to understand the grey mist came up and it all turned into a jumble of letters. The pictures didn't help either because most of them were taken either from the side or directly face on so I found it hard to draw a parallel to what was in front of me. Finally I resorted to the videos on the internet and it was full of men (usually) with egos demonstrating how to link sausage at high speed. My only option was to try and hit the pause button at regular intervals but this failed miserably too. Finally I had the luck to befriend Richard, a former butcher who showed me the technique...it's easy when you know how! 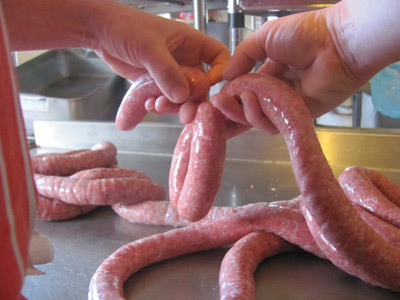 If you want to learn how to link sausage the way the butchers do it then I hope that my step by step guide will prove a little more helpful. The hands that you see are Richard's and I'm under his arm taking the photographs so that they show what's going one exactly as it will do when a round of sausage is in front of you. Note: Richard is right handed so for left handers you need to perform a mirror image. One final point, start practicing using hog casings because these are tougher. A sheep casing is easy to break (even when you are experienced at linking sausage) and collagen casings were were designed with automated machines in mind, not hand linkers like you and me. 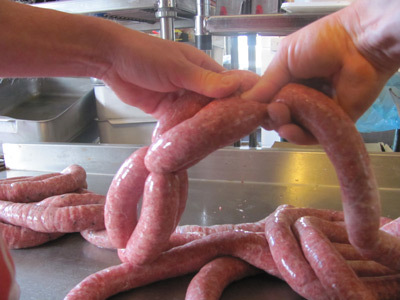 Take one end of the filled sausage casing and make three links of your desired length. Do this by simply nipping the sausage between your thumb and forefinger and the rotate the sausage. Start with the second link by rotating this sausage away from you then move to the third link and rotate this one toward you. You'll see as you do this that the wrinkled matt casing becomes taught and shiny. This is the reason why it's important not to overfill the casing when stuffing. Now that you have 3 sausages (and counting in from the end) bring the link between 1 & 2 together with the link between the third sausage and the remainder of the length of sausage. 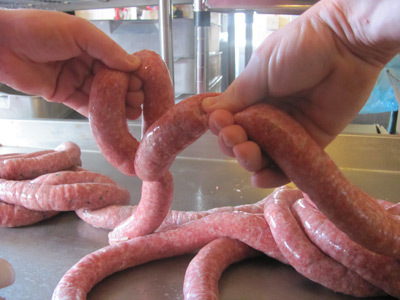 Tie this link together by twisting the two hanging sausages. 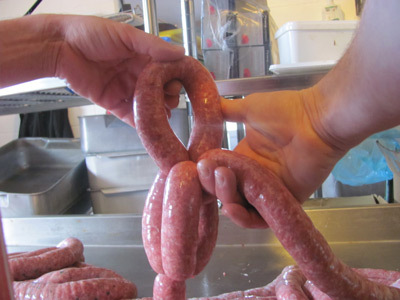 You should now have two sausages linked in a look and one hanging loose. Take the two that are looped and hold them between your thumb and forefinger of one hand. 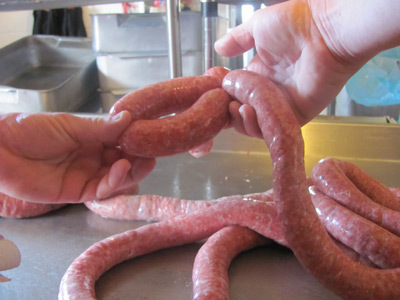 Allow your other hand to slide a "sausage length" down the un-linked casing and then nip between thumb and forefinger. Bring your hands together so that the two nipped points cross over each other and hold them together with one hand. Now comes the tricky bit. 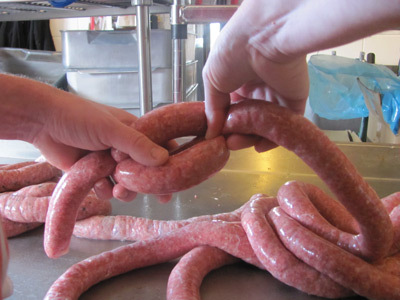 While still holding the nipped area, use your little finger to encourage the un-linked length of sausage between two of the linked sausages and you've just created your first link of three. 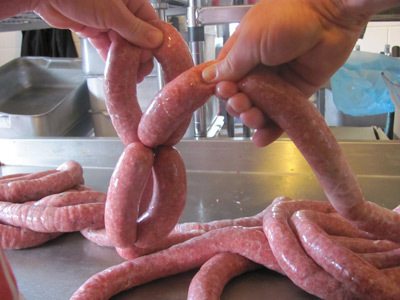 Pull through sufficient length of sausage to create 2 links. 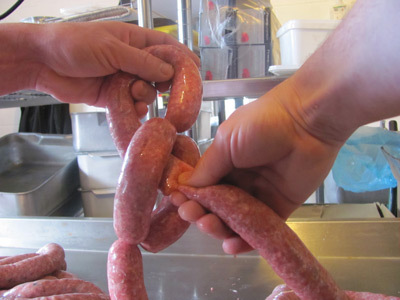 When you have pulled through enough to make 2 links, nip the sausage hold this together with the tie of the three links that you have just made so that you have created a loop. Twist the loop once to secure the tie. To create the next three links, nip the loop at the halfway point and nip the un-linked sausage one length away from the last tie. Now bring this two nipped points together, hold them between the thumb and forefinger of one hand and gently push the unlinked sausage through between one of the three sausage you've just made ie. return to step 5 and repeat. Take your time to get it right and don't worry if you break the skin a few times when starting out (we've all done it and learning how to link sausage takes time). Just throw any burst sausage meat back into the stuffer, put it down to experience and make some more sausage.